Tattoo Blog » What Would Jesus Tattoo? 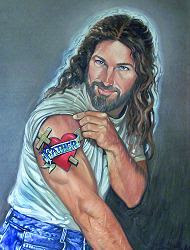 Tattoo Blog » News » What Would Jesus Tattoo? Once upon a time, John Lennon of the Beatles told the media that the Beatles were more popular than Jesus Christ. When the story eventually made its way into the American media, it exploded, instantly becoming a rallying cry to the forces of religious might against the wicked excess of pop culture. It was perhaps one of the first moments in history where the battle between pop culture and religion really erupted, that is, the moment where a line was drawn in the sand. One was either going to fight on the side of the pious or perish by the godforsaken grip of rock n’ roll, long hair and all things cool. But hey, that was 1966 and back then, religion had some weight to throw around. Today religion certainly does still carry a lot of heft, but it’s at least arguable to say that pop culture as well as the general population itself is far less afraid of stepping on the mighty toes of the righteous. To be sure, this is a time where Christianity is striving to bring in as many followers as possible, in light of so many people simply losing interest in regularly attending a church. Which brings me to the story of the Gold Creek Community Church in Mill Creek, Washington. The reverend of this particular church has decided to incorporate something different, something new and dare I say something incredibly popular into his Sunday sermons. You guessed it, rather than take the defensive against the abhorrent likes of pop-culture, Rev. Dan Kellogg is embracing it and trying to use it to win followers over to God. His six week series is called “Permanent Ink” and involves Kellogg preaching on stage, while a tattoo artist tattoos church goers with permanent reminders of their faith. Far be it for me to knock anyone’s religious devotion or their intentions with the tattoos they place on their body, but while Kellogg asserts that he’s neither encouraging nor discouraging tattoos and that all of this is simply a powerful message and a unique way to get it across, I can’t help but smell a well groomed yet completely transparent publicity stunt. The truth of the matter is that tattoos and religion have nothing to do with one another. Yes, a tattoo can be spiritual and yes, religion can influence the decision to get a tattoo, but Rev. Kellogg’s “Permanent Ink” sessions are in my opinion, little more than a quick grab at the tattoo bandwagon, a way to use the current pop culture as a means to bring in a few people who might be misguided enough to believe that real, lasting spirituality can be achieved by simply inking a tattoo onto your flesh.